Avocado halves with their natural boat-like shape make perfect ‘receptacles’ for all sorts of goodies. Try stuffing them with peas, mint and feta for a super tasty (not to mention healthy) treat! But here’s the disagreement: he insists that it’s healthy to eat the exact same supermarket tuna and cucumber sandwich every day, whereas I think it would be far better for him if he tried to vary his diet a bit more! Whatever you think about this, I’m betting that the majority of you do/would get a bit sick of eating the same thing every day for lunch. I must admit I’m not always much ‘better’ than Mr. Scrummy myself. I may not have a tuna sandwich every day like him, but I can easily get stuck in a similar rut of always defaulting to a sandwich – boring, and not always the healthiest if it’s made with a thick doorstop of bread and smeared with mayonnaise like mine often is. So this past week while I was on holiday in the beautiful far south west of England I happened to leaf through a magazine in a café and spot an article suggesting some healthy lunch ideas. One recipe was for something very similar to this pea, mint & feta avocado boats recipe. I’m afraid I didn’t even look at which magazine it was to be able to credit the idea to them (sorry, unknown magazine!) but fortunately I remembered the general idea so that I could test it out when I got home. Not only was it a relief to make myself such a healthy snack – after a week of eating DELICIOUS but, let’s face it, pretty naughty treats like Cornish cream teas, Cornish pasties, fish and chips and gourmet burgers – but these also had me seriously ooh-ing and ah-ing at how tasty they were. There’s plenty of food that I class as delicious, but I would class this is EXCEPTIONALLY DELICIOUS. I have just scarfed the second half of my avocado a day after making it and I swear that it was as yummy as yesterday (although it looks slightly past its best so I’d recommend making or at least assembling your boats just before you’re ready to eat). Click the picture for another yummy avocado snack! So what’s so delicious about this cute little lunch (or snack or appetizer)? 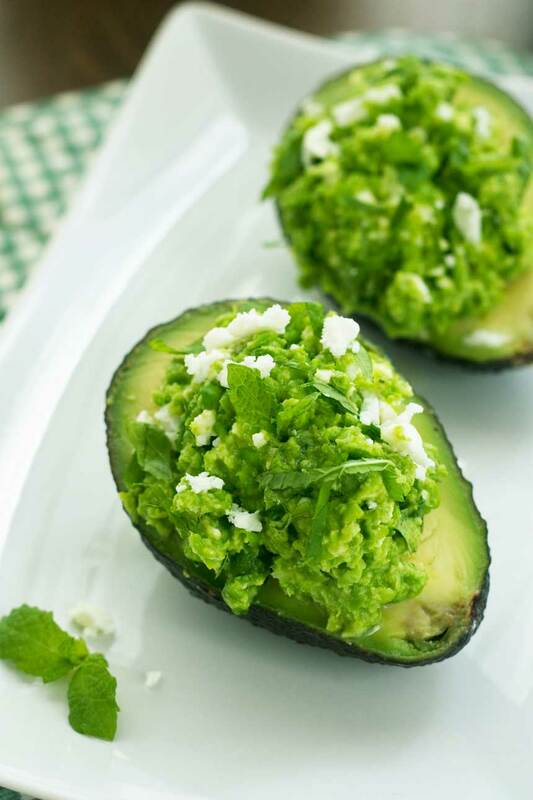 Well, imagine this: creamy avocado, sweet smashed peas, tangy lemon, salty feta and fresh mint – all in one mouthful. This all makes for a pretty much perfect balance of flavours, in my humble view. Aaaand … you don’t even have to defrost the frozen peas you’ll use to make these (big bonus). Just rinse them under the tap to wash off any excess ice and whizz them up in a food processor (or handheld one like this , which I love and use A LOT) with a bit of olive oil, lemon juice and garlic. Then stir through fresh chopped mint and feta and pile on top of your avocado halves. 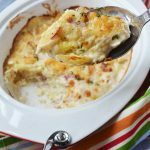 Mmmm … and, I must say, it’s somehow fun to scoop up all those gorgeous flavours with a spoon and then smoosh the filling back into the gap you’ve left (I know, it really doesn’t take much to impress some people). 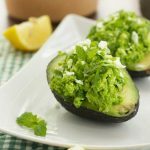 If you happen to rather like the sound of this idea of stuffing avocados with pure deliciousness, please do check out my friend Megan’s recipe for an avocado-stuffed 7 layer dip. I immediately thought of this when I spotted the recipe in the café magazine! Just before I go, I thought I’d leave you with a photo of the little fishing village where I was when I spotted the magazine in the café. Gorgeous, right? 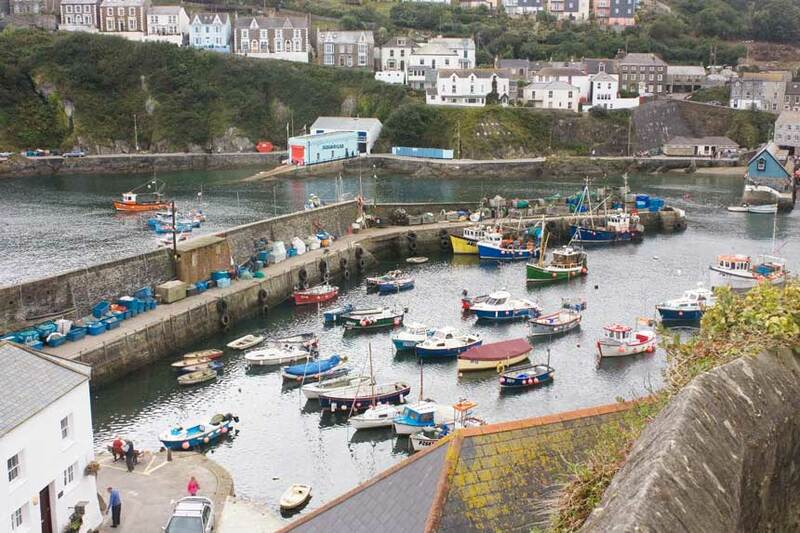 A beautiful Cornish fishing village called Mevagissey … great for seafood, Cornish pasties and fish and chips! 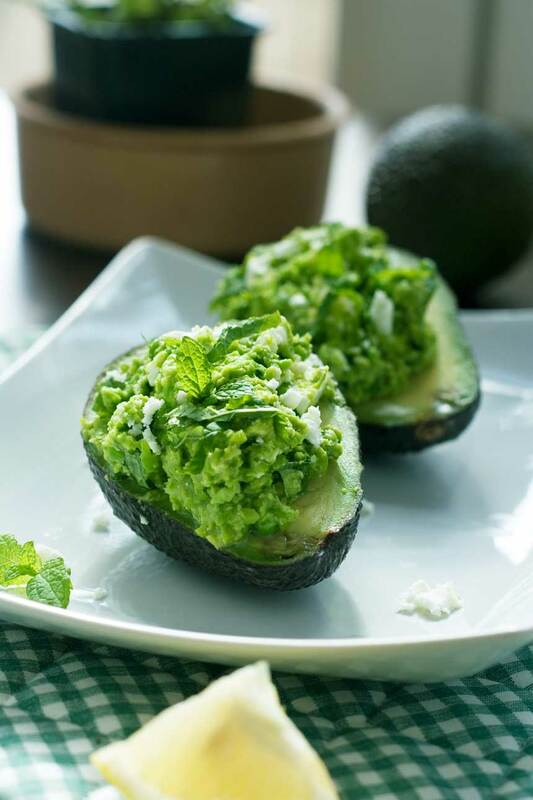 Avocado halves stuffed with a super tasty mix of pureed peas, mint and feta cheese. Whizz the peas, olive oil, lemon juice and garlic together in a food processor, then tip into a bowl. Stir through the feta cheese and mint. Slice the avocado in half, removing the pit, and rub the top of each half with the cut side of a lemon (to stop it going brown). 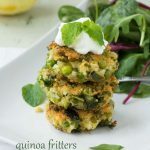 Pile the pea mixture into the avocado halves, then sprinkle over a little more mint and lemon juice to taste. Grab a spoon and enjoy! 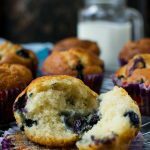 You are so sweet to link to my recipe – completely unnecessary, but great minds think alike! Like you, I too slather sandwiches (or everything?) in mayonnaise. Like Mr. Scrummy, I too could eat tuna sandwiches every day of the week (because sandwiches) but I would end up using too much mayo. Then again, I agree that a varied diet is always better! But at least he isn’t living off Doritos. There is always a scale of relative health, right? 😉 I especially love the language of your recipe today. Who wouldn’t want to whizz, tip, and pile these gorgeous, healthful ingredients? Just beautiful!!! I love how easily this comes together! Perfect timing. My snack is usually half an avocado with chili sauce and edamame and I’ve been looking to try something different and now I’ve found it. I can’t wait to try these delicious little boats. Oooh, edamame would definitely work instead of the peas, Janette! I love, love, love avocados so you now I’m all over this dish! Such simple prep but so much flavor – this is perfect as a snack, side, or en lieu of a salad! The vibrant green color is just stunning and your photos are gorgeous, Helen! Haha … I did think for a minute you meant the avocado boats are quaint and English! This is a great flavour combo, isn’t it? 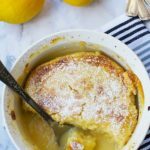 The lemon really adds something, too – honestly I was in food heaven while eating this! Hi Helen, I love variety but when it comes to breakfast, uhmmm, I eat either oatmeal or avocado toasts, so boring for my husband every other day or so you know I would absolutely love these avocado boats. So amazing! 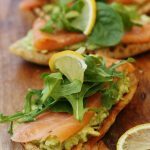 Your photograph and recipeis really awesome – a lovely way to change up my rather boring avocado lunches. Strange, isn’t it? We’re all different I guess, but OUR way is best, of course!! 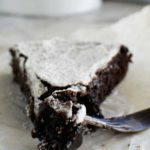 Usually if I see a decadent cake I want to leap through my computer to get it, but this looks so delicious and fresh, i want to have it now!! Wow, what a compliment, Shellie! My avocado recipe can compete with a cake!! Look at all the green in those photos. I love it! My husband is exactly the same. He would happily eat the same thing every day (tuna too) and not get bored. Not only would I get bored, but it is much healthier to have some variety. Thank you, Jess! Cornwall really is lovely, isn’t it? And all those yummy food options … although not the healthiest! Oh Helen I can just see myself smearing this on toast! What a beautiful way to serve avocado!!! Thank you, Mila!! I don’t know if this is what you meant, but I bet the whole lot (including the avo) would be good smeared on toast! mmm … making me hungry thinking about it! I’ve been adding avocados to everything lately 🙂 I can tell these boats taste delicious by just looking at them! Love the idea! By the way I can eat tuna sandwiches every day, too 🙂 Pinning and sharing this recipe! Thanks, Mira! 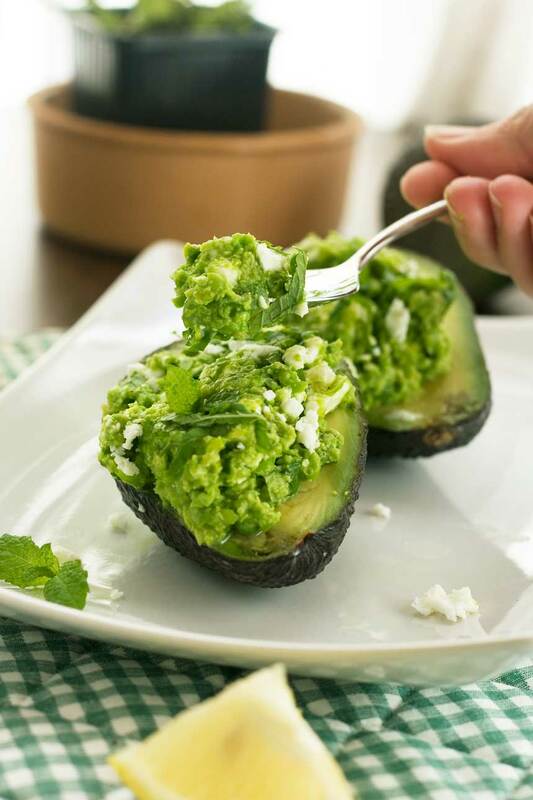 If I had to choose just a few foods to eat all the time, avocados would definitely be in my list! Helen, I don’t think I could eat tuna for lunch everyday – but, I think I could eat these stuffed avocados for lunch just about everyday! 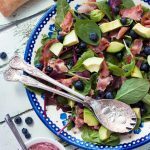 Avocados are my fav – what a refreshing dish this is! Totally agreed, Shashi! I’m in the ‘could eat avocados every day’ camp!! Thank you so much, Cathleen! Bright green and gorgeous! 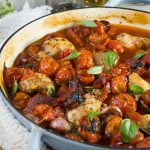 I love these quick and easy flavours and simple and easy lunch idea. 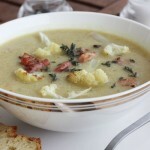 Actually I might even love this for breakfast too or even as a started for a main course. Forget the cucumber sandwiches with mayo, this tops it! This is a winning little number. Sharing and pinning! OMG, Helen! I hear you! My husband would eat a club sammie every day for the rest of his life if I didn’t pack something else for him and FORCE him to live life! lol I LOVE stuffed avocados and these are seriously gorgeous!! LOVE LOVE LOVE all the vibrant green and fresh fabulous flavors! Swoon! Pinned! Cheers! Thank you so much, Denise! 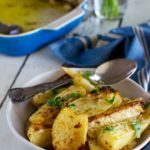 It really does taste as good as it sounds so I hope you give it a go. I’m an avocado addict, too, but at least it’s a healthy addiction, hey?! after making this I must go try meggans! wow! all the green avocado goodness … You know I love! WOnderful friend. Thank you, Lindsay! I’m really happy to have made something that you approve of! And of course I also approve of trying Meggan’s avocado recipe. She’s the best! Lovely combination of flavors…got to try this out!